Two Pennsylvania Catholic bishops, Pittsburgh Bishop David A. Zubik and Erie Bishop Lawrence T. Persico, have called for prayer for religious freedom on March 23. On that date oral arguments will be heard by the United States Supreme Court on the Zubik v. Burwell case, an appeal challenging the U.S. Department of Health and Human Services’ contraceptive mandate. Both dioceses are among the petitioners. The “HHS Mandate,” part of the regulations of the Affordable Care Act, requires employers to include contraceptive services, including contraceptive means that could cause abortion, in their employee health care plans. Faced with opposition from a number of groups on the grounds that the mandate is an infringement on religious liberties, the HHS, which is now headed by Secretary Sylvia Mathews Burwell, issued a very narrow exception which in effect upheld the mandate in most cases. Under the exception, non-exempted religious groups could decline to directly provide contraceptive services on their employee health care plans but would be required to report the names of the employees to HHS who would then require health care insurers to provide the services anyway at no charge. The religious entities argue this changes nothing because the requirement to report makes the religious employer complicit in the provision of contraceptive services, in violation of their religious beliefs. Around the country a number of appeals were filed in courts opposing the mandate, and those lower courts ruled either in favor of HHS or in favor of the appellants. While the Supreme Court will have the final say, should its ruling be evenly divided — as it well might be with the death of Justice Antonin Scalia — the decisions of the district courts will hold in their area but will not serve as precedent until a full Supreme Court rehears the challenge. In Pittsburgh, Bishop Zubik is appealing on behalf of the Roman Catholic Diocese, Catholic Charities of Pittsburgh and the Catholic Cemeteries. In Erie, Bishop Persico is appealing on behalf of the Diocese of Erie, St. Martin Cemetery, Prince of Peace Center and Erie Cathedral Preparatory School. Other faith-based appellants in the case include the Little Sisters of the Poor, East Texas Baptist University, Southern Nazarene University, Geneva College, Priests for Life and the Roman Catholic Archbishop of Washington. In his letter, Bishop Zubik asked that all parishes of the Pittsburgh Diocese make Wednesday of Holy Week, March 23, a day of prayer and that every parish offer eucharistic adoration for a period of time on that date. “This is a special opportunity to drop to our knees united in prayer, lifting up our collective petitions to our Heavenly Father,” he wrote. On March 23, the day of the oral arguments, hundreds of religious women, college students and clergy will participate in a “Let Them Serve” rally in front of the Supreme Court in support of religious freedom. Among them will be former Philadelphian and former spokesperson for the American bishops on life issues, Helen Alvaré, along with members of the group Women Speak for Themselves. In Philadelphia at 10:30 a.m. on that day, the Archdiocese of Philadelphia’s Office for the New Evangelization and Women Speak for Themselves will sponsor a rally on the steps of the Cathedral Basilica of SS. Peter and Paul. Afterwards, participants will spend time in service at Holy Family Home, a home for the aged conducted by the Little Sisters of the Poor in West Philadelphia, according to Megan Schriever, of St. Norbert Parish in Paoli, the local WST spokesperson. 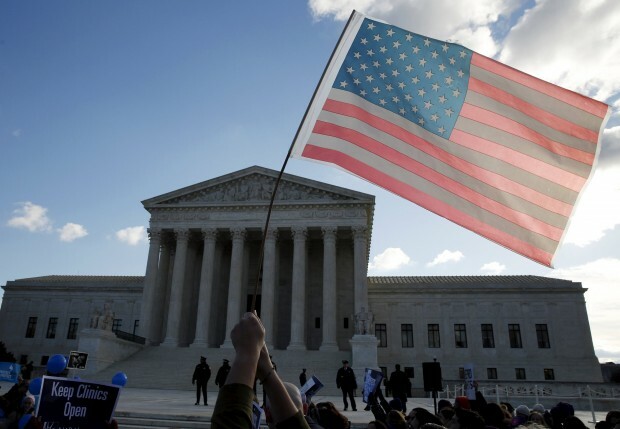 Inspire, we pray, the Supreme Court justices of our land, so that freedom of religion might be upheld, not simply as the right to worship, but to live our faith in word and deed. We ask this through our Lord Jesus Christ, your Son, and with the help of Mary, our dear Blessed Mother and patroness of our country. Inspire, in this hour, the Justices of the Supreme Court of the United States. May they uphold the rights given by our Constitution, protecting freedom of religion for all people. We ask this through Jesus Christ, your Son, and with the help of Mary, our dear Blessed Mother and patroness of our country.